Pictured Above: Ms. Barakisu Yusuf of the Gofal Sahi community drawing clean water from Biosand filter. Ms. Barakisu has been staying in the community for several years but has never had the opportunity to taste clean water. Through a pilot test of our Community Choices for Water tool, Ms. Barakisu and nine other women constructed Biosand filters using locally available plastic containers, river sand, and gravel. “I am really so excited that this clean water is coming from my Biosand filter,” she said. Choosing the Biosand filter from the many water treatment technologies recommended by the Pacific Institute’s computer-based Community Choices for Water tool Barakisu thinks is helpful because they would not spend any money to maintain the filter and yet their frequency of visiting the hospital and paying medical bills will be minimized. 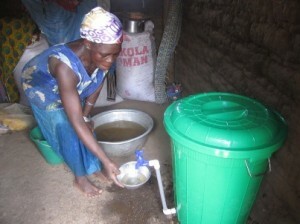 The photo above shows the clean water Ms. Barakisu is drawing from her locally made Biosand filter. She promised to be an agent of change by passing the knowledge of water treatment technologies available, especially the Biosand filter, to other people. During the rainy season, Gofal Sahi is cut off from every part of the region and the river water becomes so turbid that even filtering it is not easy. The community members who have installed the Biosand filters were worried that the technology would not function very effectively during the rainy season. However, their fears were allayed when the community was taken through the maintenance procedures of the filters.